Auston Matthews and Morgan Rielly led the way for the Maple Leafs on Thursday. Matthews scored twice and Rielly had a goal and an assist as Toronto downed the Detroit Red Wings 5-3. That was the third straight win for the Leafs, all since they departed on a week-long road trip last Sunday. Moving to 4-1-0 with the victory, Toronto is first overall in the NHL standings, a point ahead of the Carolina Hurricanes and the Anaheim Ducks, and four Leafs are perched in the league's top four scoring spots: Matthews and Rielly with 12 points apiece (Matthews has more goals so he's No. 1); and John Tavares and Mitch Marner taking the third and fourth spots with 10 points each (Tavares is No. 3 as he has more goals). Morgan Rielly entered Thursday’s game tied for the Leafs’ and NHL lead in points with 10, as only the third defenceman in league history to tally 10 points in his first four games. By the end of the first period, Rielly would briefly have more points than any player in the NHL. He got Toronto on the board late in the opening frame while trailing Detroit 1-0, winding up from the hashmarks and burying a slick setup from John Tavares and Mitch Marner for his 11th point of the season. Rielly would tally his 12th with an assist on Auston Matthews' second goal, pushing him past Bobby Orr for second-most points among defencemen in NHL history over the first five games of a season. 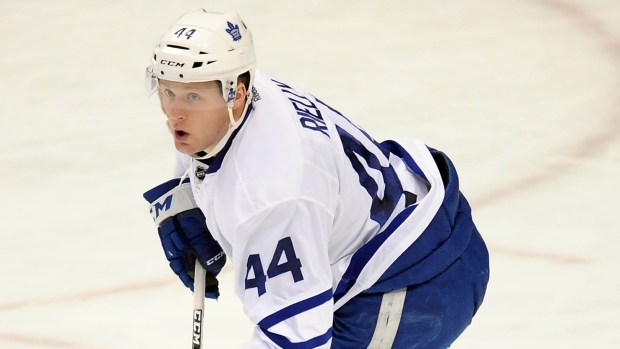 It wasn’t just Rielly’s offensive contributions making an impact. He made a couple heads-up passes to Toronto’s forwards, including a terrific one to Tavares early in the second period that let the Leafs get rolling around in the offensive zone. There’s long been pressure on Rielly to live up to the number one defenceman mantle in Toronto, and while it’s still early in the season, his smart, consistent play shows how he has kept expanding on his skill set and continued to grow after a career-best season last year. He finished the game with two points (goal, assist) and a plus-1 rating. Since the Leafs’ opening night, Matthews has commanded the team’s – and the league’s – spotlight with a dominating five-game stretch. In Detroit, Matthews only further fuelled the fire, scoring twice on the power play to reach nine goals on the year, while extending his season-long point streak to five games. It also marked the eighth straight game Matthews has scored against Detroit, at least one goal in each game he’s ever played against them. To say Matthews has shown a new side of his already-elite skill set would be an understatement, and by game’s end he and Rielly sat atop the NHL leaderboard with 12 points each on the season. Only three players in the last 30 years – Alex Ovechkin, Mario Lemieux and Patrick Marleau – have scored nine goals in the first five games of a season, and Matthews became the third player in Leafs’ history (first in 74 years) to accomplish that feat. Meanwhile, Tavares is having a hot start of his own to this first season in Toronto, adding four assists on Thursday (his first helpers of the season) to reach 10 points on the year. For all the talk of Toronto’s depth down the middle during the off-season, it’s perhaps not surprising there’s an outlier amongst their top three centres, but Nazem Kadri couldn’t be much further behind his counterparts. Kadri is still looking for his first goal of the season, having tallied just three assists thus far. After spending the second half of last season flanked by Marner and Marleau, two offensively gifted wingers, Kadri failed to click the same way with Josh Leivo and Connor Brown out of the gate, and Par Lindholm has replaced Leivo on that line with Kadri and Brown as they try to find a spark. The absence of William Nylander has affected Kadri in that regard, since if he were with the team Kasperi Kapanen would likely be bringing his elite playmaking ability to Toronto’s third line instead of skating on Matthews’ wing. Kadri has had his chances at even strength the last two games, watching in frustration as pucks rang off posts, but the real difference from the previous two seasons has been his role on Toronto’s power play. Kadri led all Leafs with 12 goals on the man advantage last season, but with the addition of Tavares reworking Toronto’s top power play unit, Kadri is more of a decoy now, although his teammates seemed to make an effort to get him more touches on Thursday. It’s not a long-term solution for Kadri to depend on that goodwill to get his opportunities, but the sooner he lights the lamp, the better it will be for the Leafs. Kadri finished Thursday with one assist in 16:05 of ice time. It’s become an uncomfortable trend for Toronto to play from behind early this season, even when their first period play hasn’t been especially bad. That was the case against Detroit, where the Leafs played from behind for the fourth time in five tilts this season by giving up the game’s first goal. The Red Wings were outworking the Leafs initially with good pressure and holding them to the outside off the rush. Like Leafs’ opponents before them, Detroit was more immediately opportunistic. Right after Toronto killed off a slashing penalty to Kadri in the first period, the Red Wings jumped into a 3-on-1 play that ended with Nick Jensen burying Detroit’s seventh goal of the season behind Frederik Andersen. As they often do, the Leafs responded well to the setback, but it’s a curious pattern. And it’s not the only slow start Toronto has experienced, either. Jake Gardiner had another roller-coaster night in Detroit as he tries to establish some consistency in his game this season. The blueliner contributed his usual handful of eye-catching passes, but was also losing battles along the boards and seemed to struggle against the Red Wings’ more physical game. When pressured, Gardiner was forced into turnovers in the Leafs’ end and got beat multiple times in one-on-one matchups, including against Andreas Athanasiou early in the third that turned into a highlight-reel scoring chance on Andersen. Too slow in making decisions at time, the Red Wings were able to disrupt the Leafs’ momentum in the neutral zone. Gardiner tied with Rielly for most points among Leafs’ defencemen last season, but has only two assists thus far in five games without the same threatening presence patrolling the blueline. The Leafs’ back end has been a question mark for Toronto since last season, and the sooner Gardiner can get back into a good rhythm, all the better for the Leafs’ defensive prospects going forward. He closed out Thursday’s game at minus-1 in 19:42 of ice time. While the Leafs have proven they can score as well as any team in the league (Toronto had a league-leading 20 goals-for heading into Thursday night), they also claimed the third-highest goals against at 17. As loose as the Leafs like to play up front, they’ve too often done the same in their own end, showcasing poor defensive structure and some nights getting below average goaltending. For the most part against Detroit, the Leafs were able to shore up in both areas. Making his fourth start of the season, Andersen was as good as he’d been since the team’s first game against Montreal, thwarting some superb chances by Athanasiou (who prior to his breakaway chance in the third was stoned by Andersen on a clean close-range look), Dylan Larkin and Thomas Vanek. He was the much less busy goaltender with Jimmy Howard seeing twice as many shots on the night, but Andersen stayed sharp when he needed to be, especially in the third period when Toronto’s old defensive woes returned and Detroit won the possession battle at a startling 80 per cent. Given that, the Red Wings were able to make things interesting, cutting the Leafs’ lead to 4-3 late in the third on a shot that barely made it over the goal line. But Andersen stood tall from there, making three straight controlled saves on point shots to prevent rebound chances. In his 26-save performance, Andersen moved to 7-0-0 all-time against the Red Wings, one of four teams he’s never lost to in his career (Calgary, Edmonton, Winnipeg). The Leafs have six players all boasting point streaks after Thursday’s game: Rielly (five games), Matthews (five games), Marner (four games), Zach Hyman (four games), Tavares (three games), Hainsey (two games). Toronto caps off its four-game road trip against the defending Stanley Cup champions in Washington on Saturday.